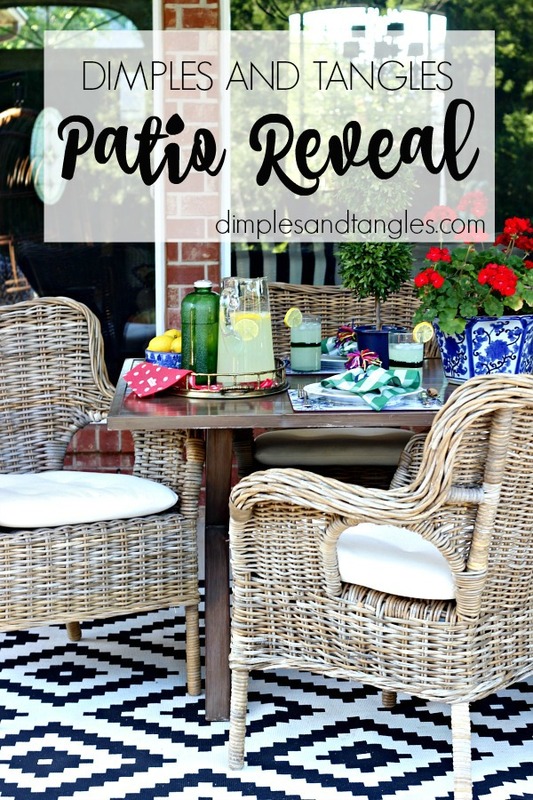 BLOGGER STYLIN' HOME TOURS SUMMER EDITION- PATIO REVEAL! 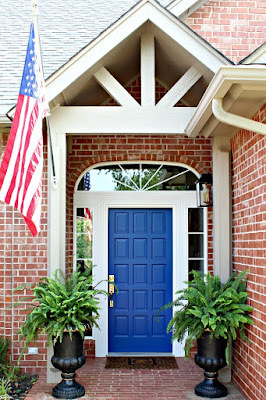 Today marks the beginning of one of the best weeks of the year... another round of Blogger Stylin' Home Tours! I've participated in this series for several years, and it's seriously always a favorite. 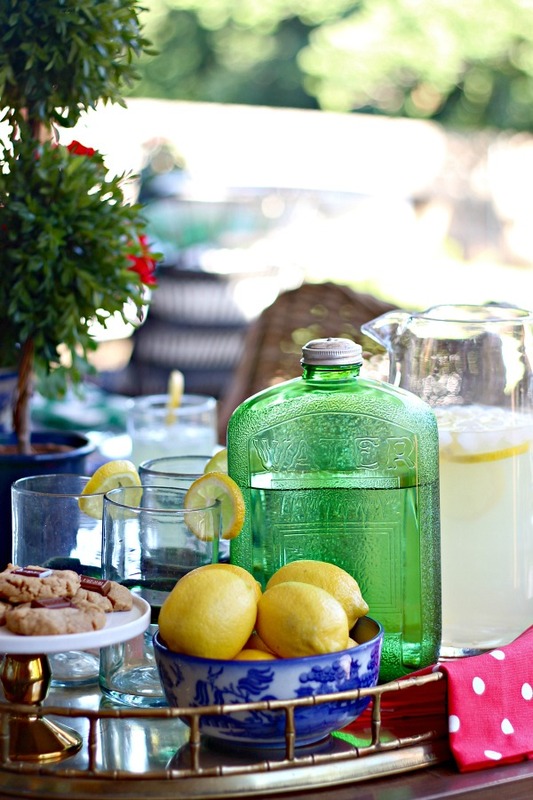 If you found your way here from Eclectically Vintage, welcome! Many thanks to my sweet friend Lindsay from The White Buffalo Styling Co. for inviting my to be part of this tour once again. 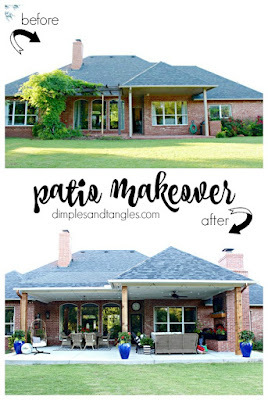 Almost exactly a year ago, we started the process of a big patio makeover. 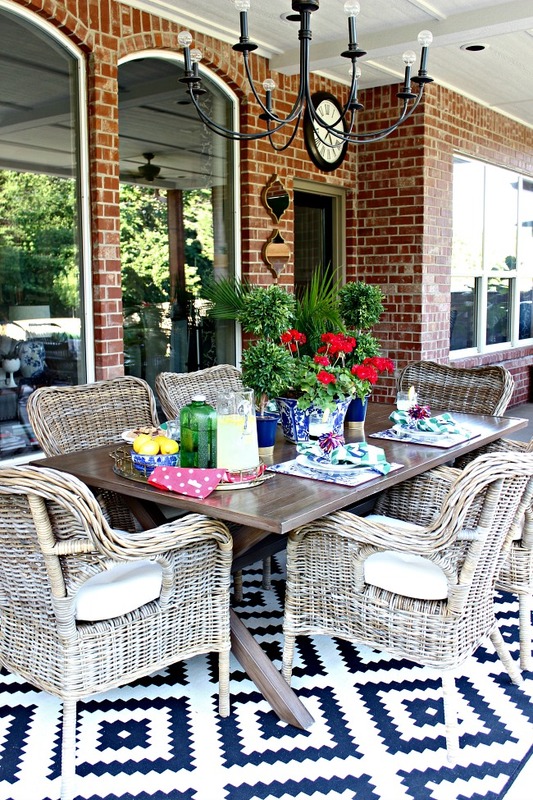 The major work wrapped up earlier this Spring, but it took me a little while to get everything just how I wanted it, and I wanted everything to be pretty and green outside, so I thought today would be the perfect day to show you around our new outdoor living space. 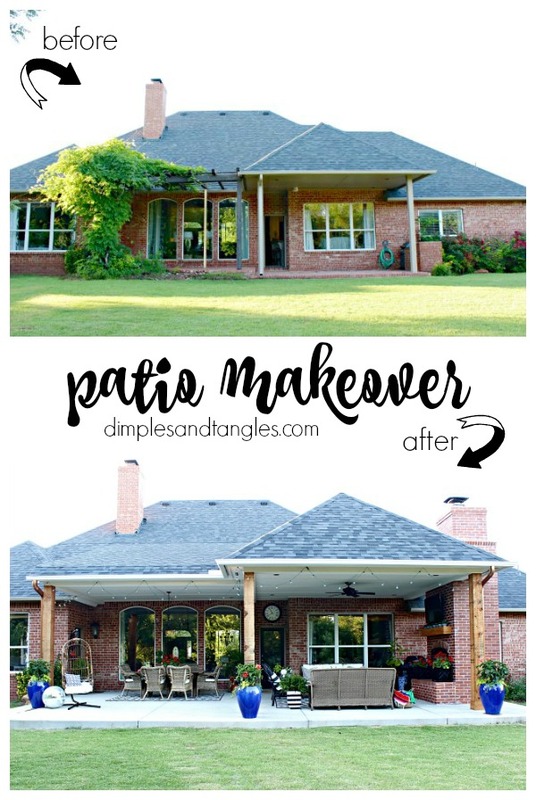 Links to all of the posts in the patio makeover series, as well as all sources are listed at the end of this post. Here's where we started out (it's cleared off for demo here, but this is how it used to look furnished). 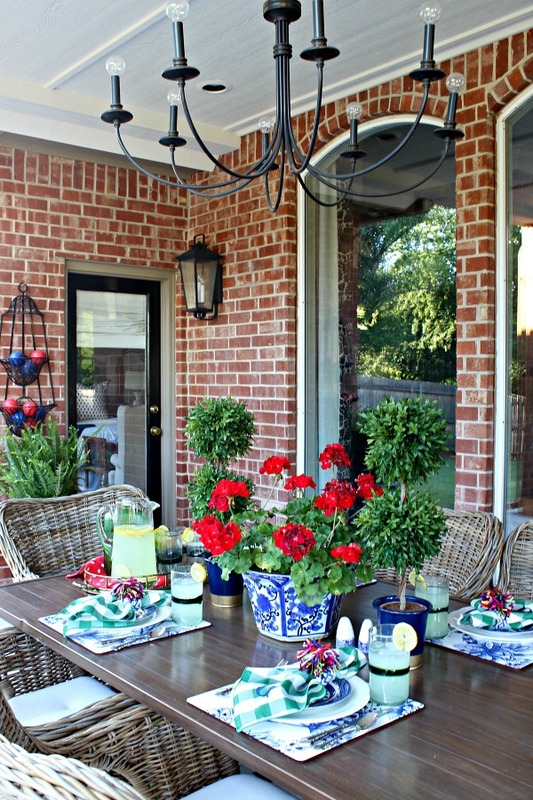 Other than overgrown landscaping and a past due pergola, it was a great space. 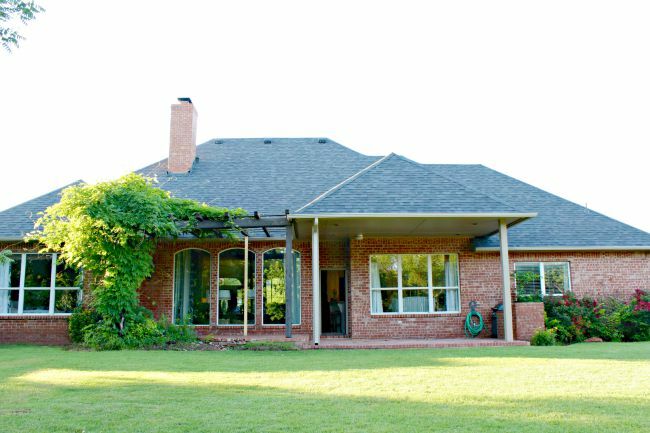 However, we wanted to make the area larger and expand the covered roof. The flooring was brick, which I loved, but it was also split level so we gave up the brick in order to have a large cohesive slab that was all one level. After months of planning and construction, here it is all finished! We just about doubled the square footage and added on to the roof to allow for more of the area to be protected from the elements. We really have 3 different zones- a living area, a dining area, and an open area that isn't covered. I think the fireplace is my husbands favorite addition- he builds a fire no matter the weather, but it's especially nice on cool mornings and evenings. A pierced brick half wall between the fireplace and the house creates a little cubby for the grill. We also have a faucet up on the patio, so the holes in the brick wall allow us to feed the hose through that side rather than dragging it across the patio. Scout approves of the sofa! This post is so photo heavy, please click over to see the rest of the tour! Where the old pergola used to be, now we have a completely covered dining area. I just planted everything in these pots over the weekend. I'm looking forward to them filling out and trailing down the sides. We have already been using the space well. We've hosted several gatherings of family and friends, and we are out there daily. It was and will be worth every penny of the investment we've made! Be sure to follow along with the rest of the tours this week, too! I can't wait to see the inspiration overload! 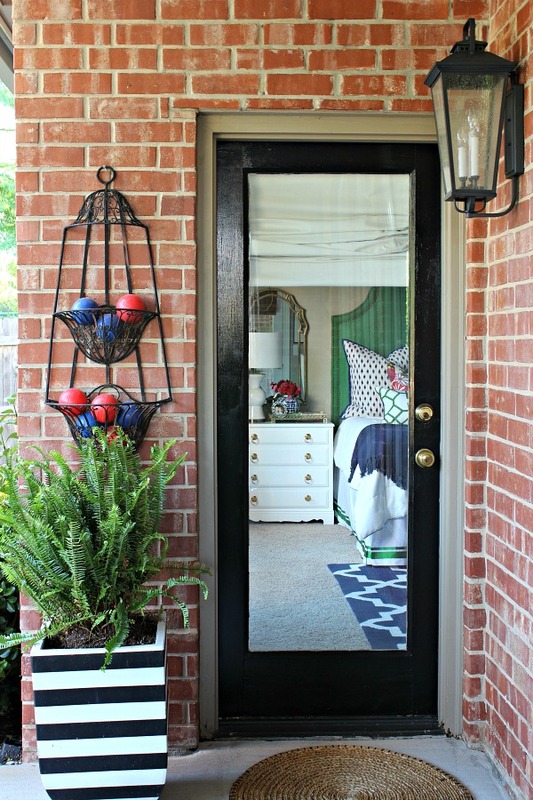 this space is a total DREAM, jennifer! i am in love and want to come over! and i love the shot into your bedroom- glorious! 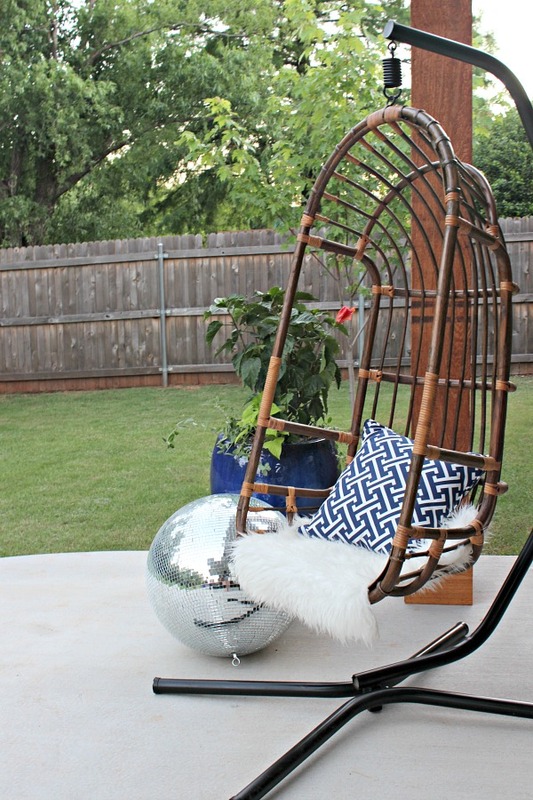 I have hanging chair envy! It's so so pretty and colorful and so you! WOW - if I bring cocktails, can I invite myself over for dinner and s'mores in that fireplace?! 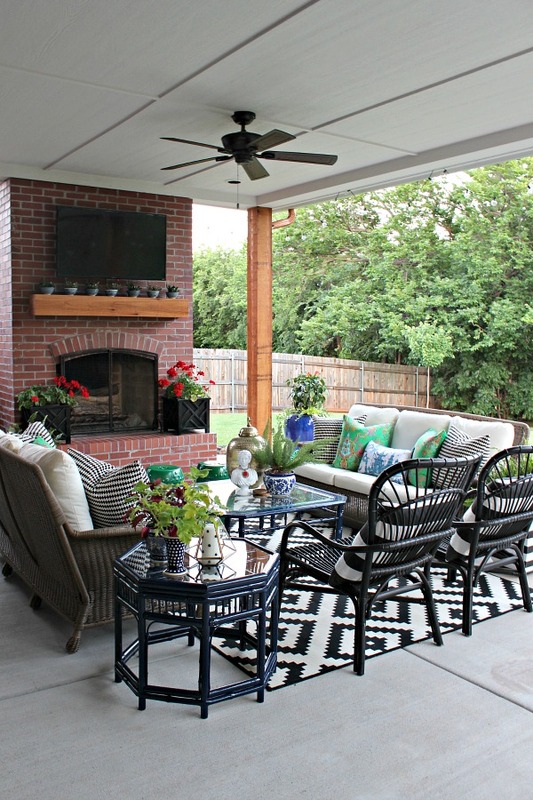 I wish I had a covered outdoor area - enjoy! 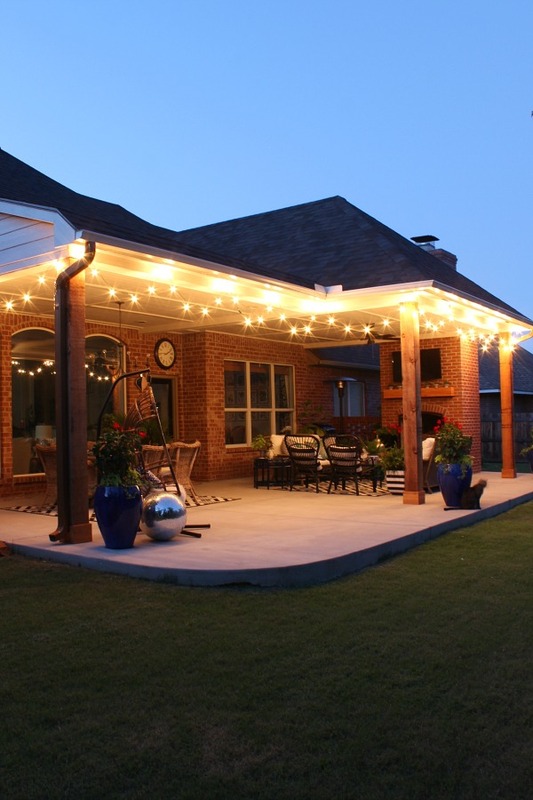 It turned out to be the perfect outdoor space. I love that you have a living and dining area. Beautifully decorated as usual too. I think I would live out there. Such an amazing space! I know it will be well used and well loved! 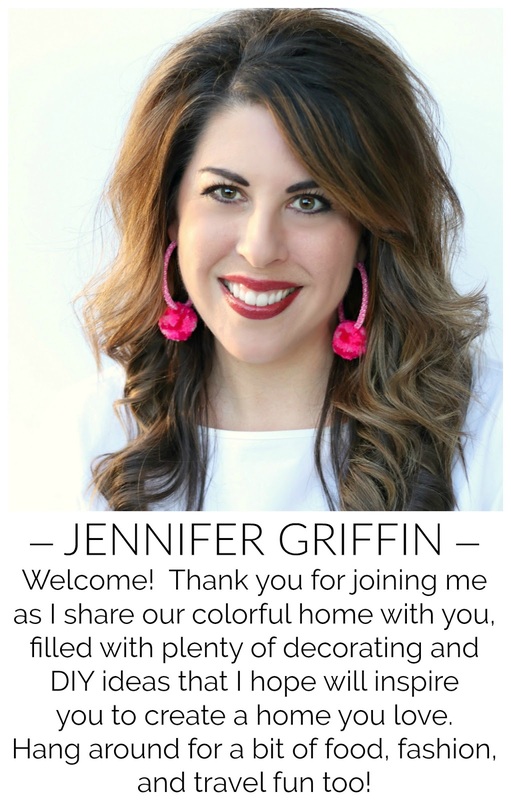 Jennifer you did an amazing job designing the renovation and how you would use the areas! 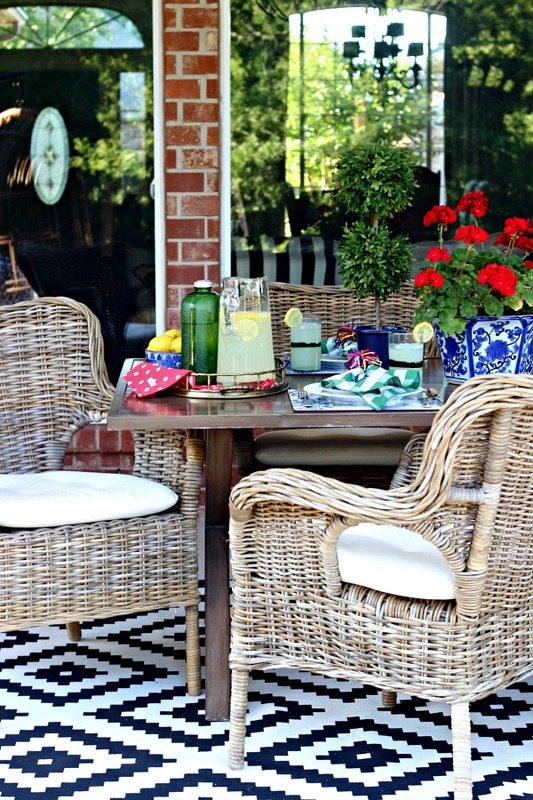 Your entire outdoor space looks beautiful and I imagine it functions so well for your family and for entertaining!! I hope you're enjoying it all, what a huge quality of life project!! I love it! Gosh, everything is just beautiful, Jennifer! It's apparent that you thought through all of the planning really well so that the spaces work well for your family. I love that your son is so enamoured with the new chair :) As usual, your details and colors are both classy and fun!! 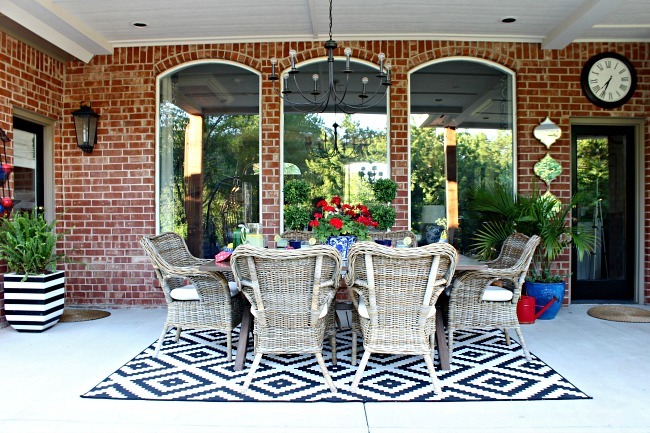 Wow, such a beautiful space, I love how it perfectly transitions from inside with your fun signature style! 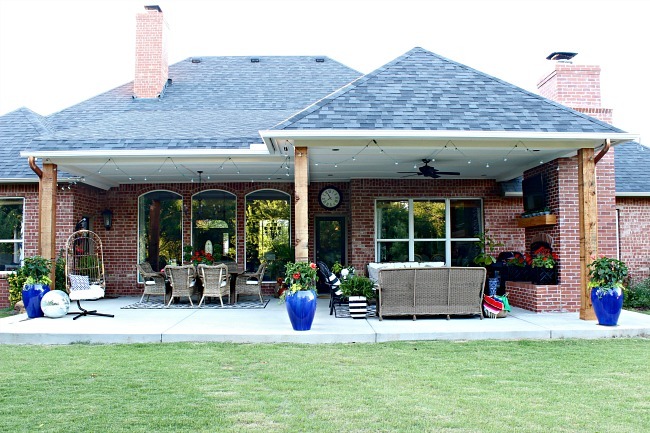 What a great space for your family and friends to enjoy! Happy Summer, friend! Such better use of space. It makes the whole backside of your home look bigger! Beautiful job! 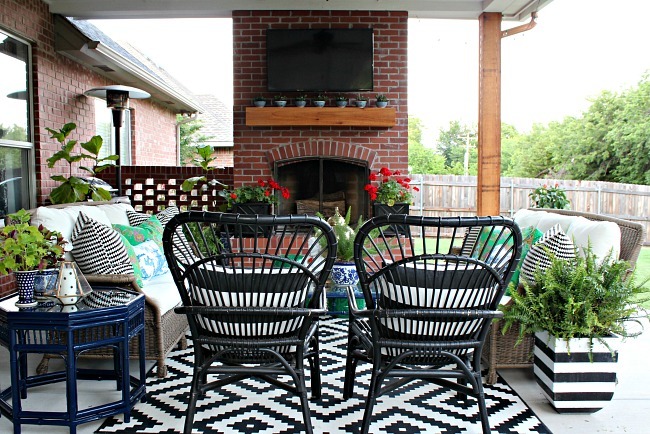 What a gorgeous patio makeover! I am always so in love with your colorful photos! 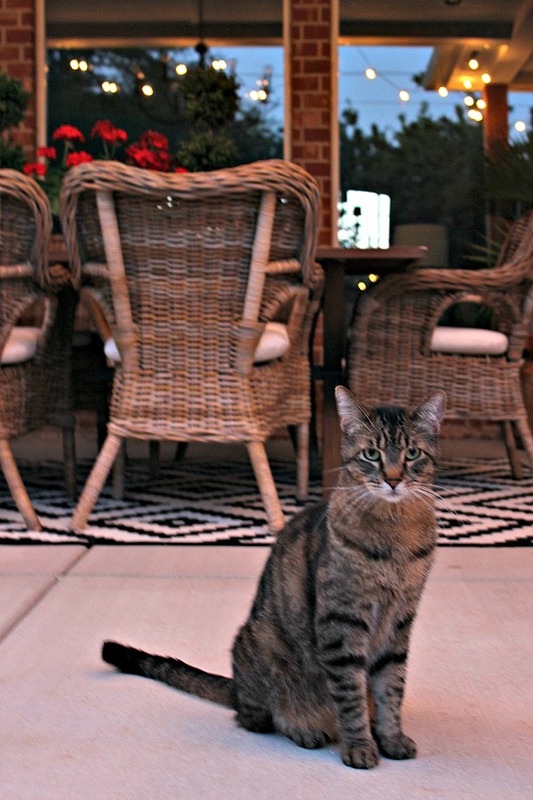 Looks like a great spot to hang out any time of day! 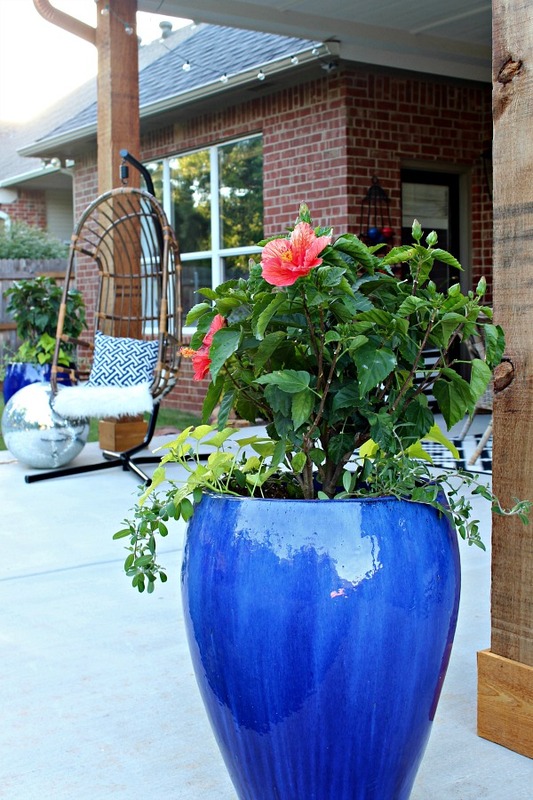 Also--Could you tell me the name of the blue planters? I'm having trouble finding them. I didn't see them on At Home's website, you have to purchase them in store. Hope you have one locally! Wowzers!!!!! Geez this is one amazing patio!!! I am so envious and definitely inspired to get mine done. Great tour!! Jennifer - Beautiful! I know you'll spend so much time there. Gurrrrlll!! It's absolutely amazing! Love it SO much! Everything is so lovely! I'm enjoying all of the details. The fact that your bust wears jewels makes me smile. I saw the TV and am wondering if anothing special was done for an outdoor TV? Special TV, wiring, etc? I would love to do this one day! Thanks Corinna! Nope, nothing special. It is up high enough and close enough to the roof that we weren't really that worried about it. We bought a fairly inexpensive tv, though, and are treating it as an experiment outside. So far so good, no problems at all. However, it is mounted so that we can release it from the bracket and bring it in if the weather gets too questionable. Jennifer, you knocked this one outta the park! Erm, I mean, outta the back yard! Everything turned out beautifully! Your vision is now complete and I can't wait to see your next project. I followed your IKEA knock-off Pom Pom basket on a previous post. I see a similar one with black (?) 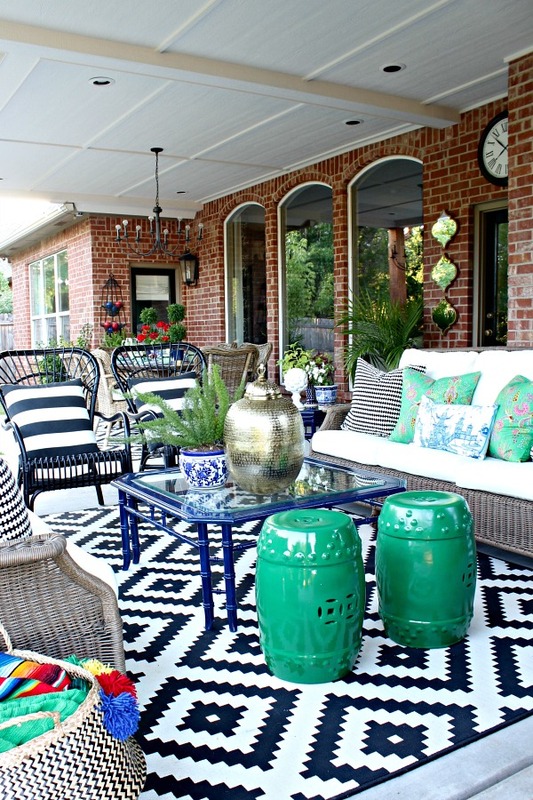 pattern on your patio. Since it wasn't listed in your resource listing, I wondered if it was the IKEA basket (only enhanced)? 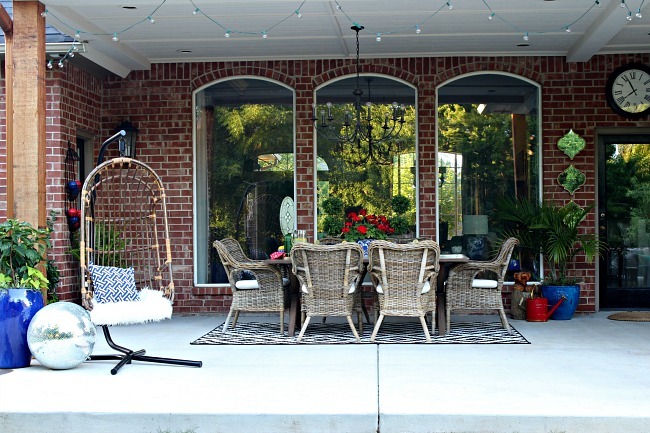 Jennifer, thanks so much for sharing this amazing space. I was going to ask about the tv but see someone already did. 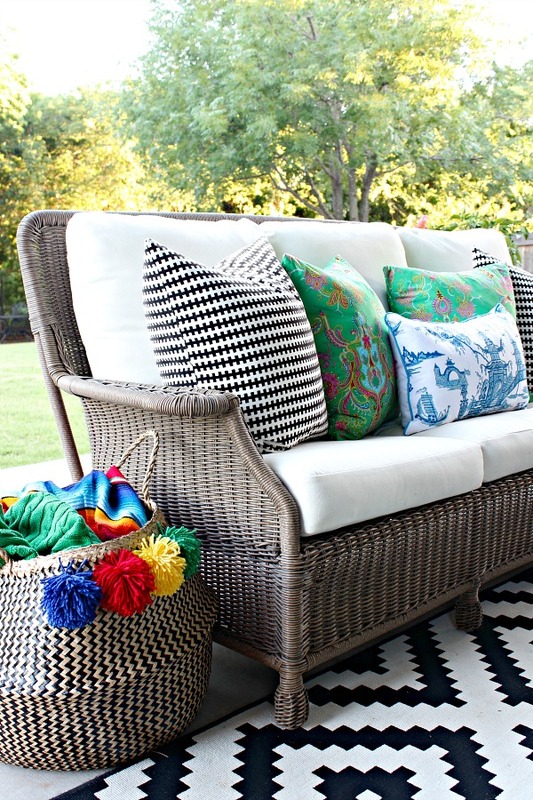 But the furniture overall, living in the Atlanta area I seem to be plagued with pollen and humidity. 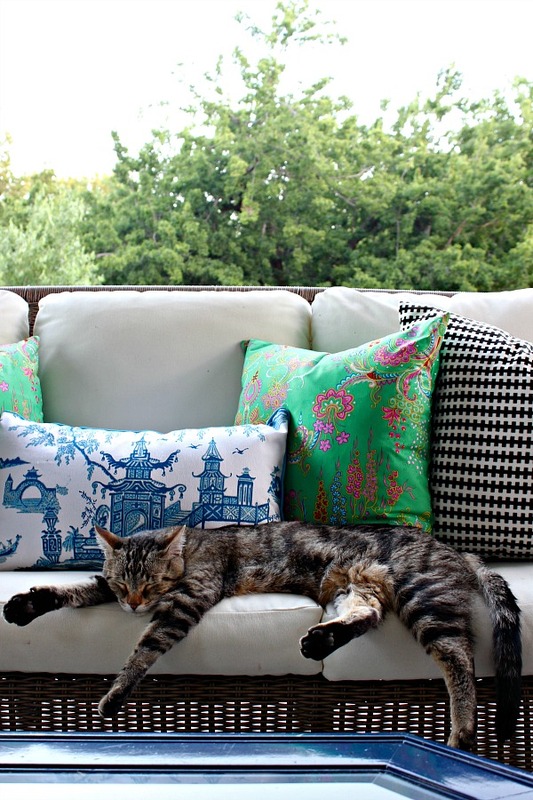 How do you care for your pillows, do you store them to keep them clean and/or cover any of the furniture. Everything is so fresh and clean! Love that comment by your son and yourfur baby enjoys it too! Thanks for sharing. 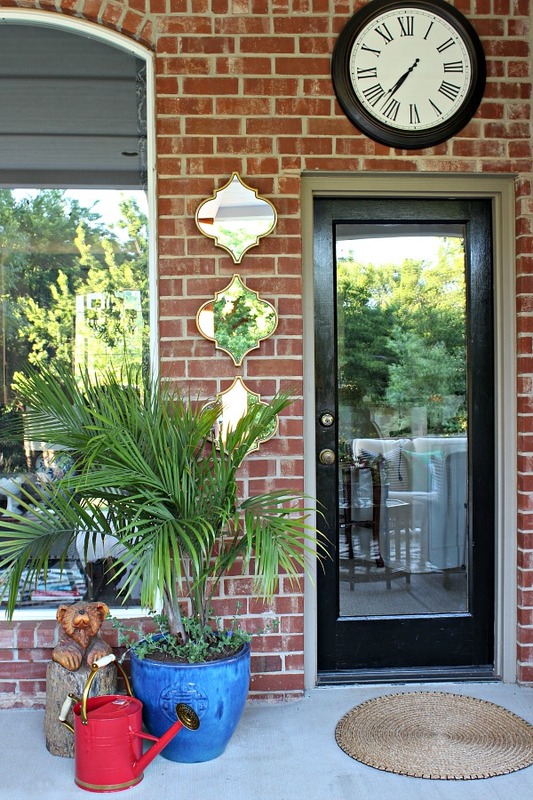 Oh my godddddd I am obsessed with your porch!!!!!!!!!!!!!!!!!! I just started following you on instagram too. GREAT JOB! Beautiful! 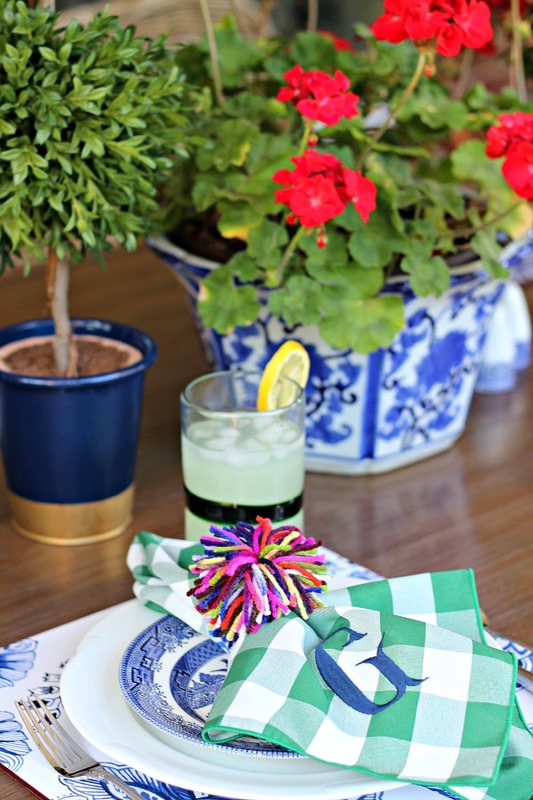 Where did you get the fabric for your green pillows? 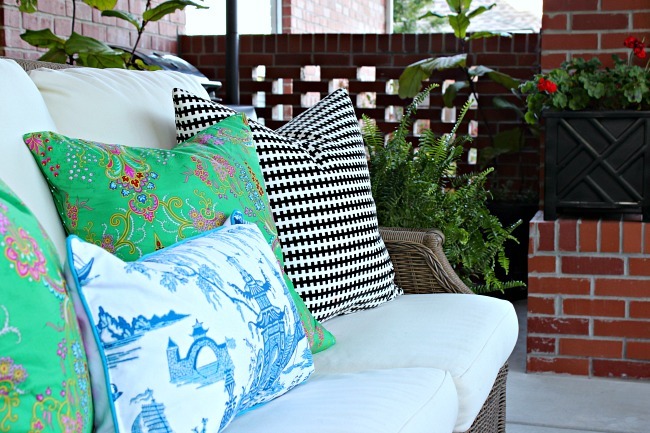 What about the green paisley pillows on the porch? I made those from a regular cotton fabric from a fabric store in Dallas. Sorry I don't have any info. on it! Beautiful transformation! I love the fire place and the comfy hanging chair. Great job! congrats on the amazing space. 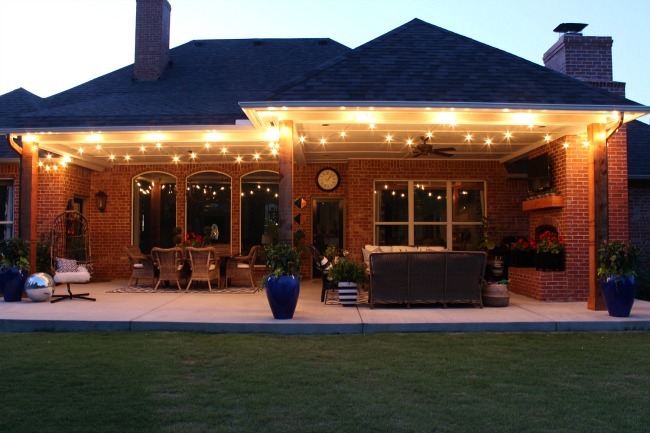 I can only imagine the beautiful gatherings you will have there. enjoy the summer! Oh wow. It looks FABULOUS!! So so so fabulous. Love all your signature colors, that fireplace looks amazing (I can see why it's your husband's favorite feature), and it looks perfectly magical at night. What a wonderful space to have as part of your home now. 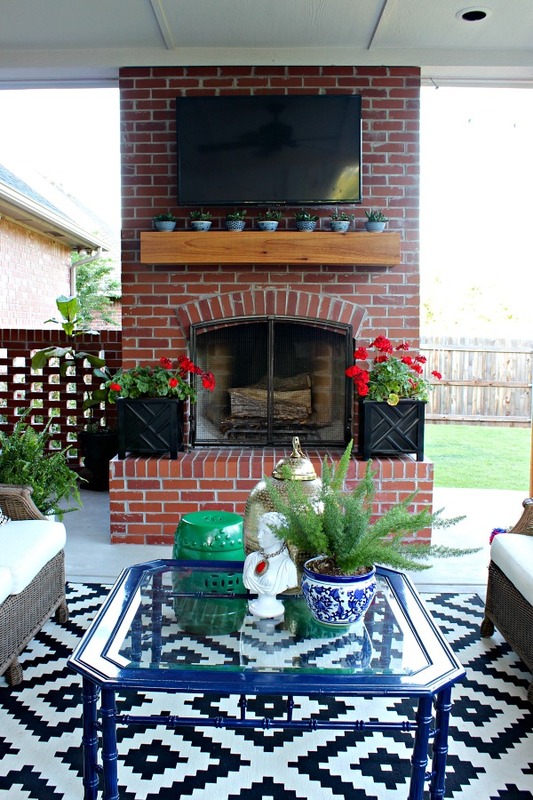 I'm blown away your outdoor space looks magical, love all the details and thoughtfulness that went into everything and now I want an outdoor fireplace, maybe one day!! So, so pretty, I love it all. So much bright, bold, beautiful color!! 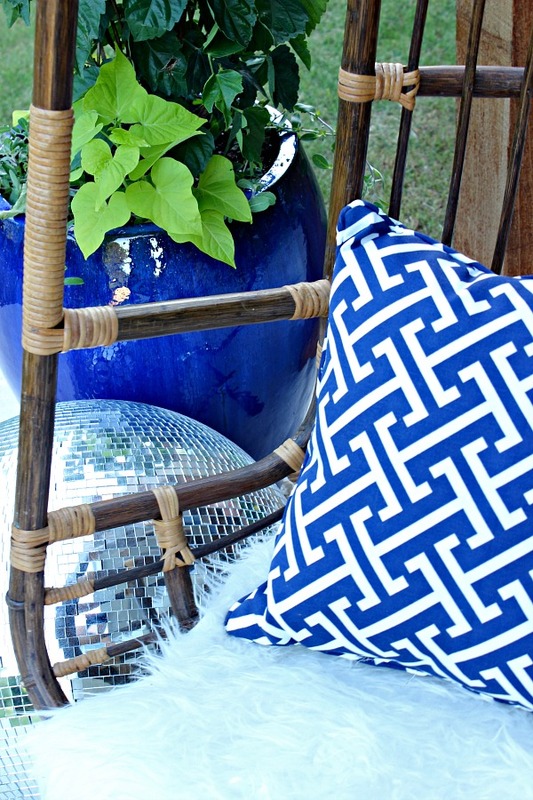 And I love all of the wicker and bamboo furniture! Jennifer, I went to the site for the blue pagoda pillow and see it is VERY inexpensive, but I guess they don't sell online???? We do not have the At Home stores here. Can you get one for me and I would gladly pay the shipping etc. Could you email me at :szpinky@aol.com? Hope to hear from you!!! This space turned out so well. There is no better place to gather than outside, even if it is just watching a show together it becomes a bit more special. 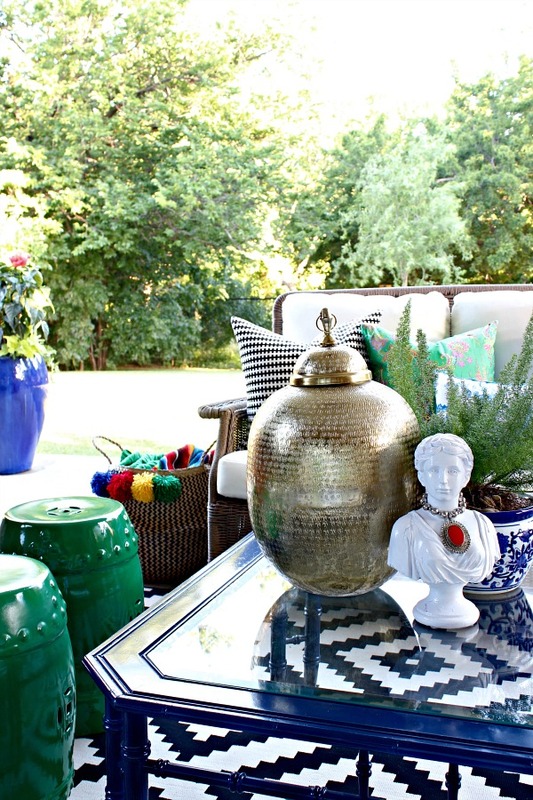 The accent chair that you found is truly a treasure. Not only does it look comfortable but it is also stylish. 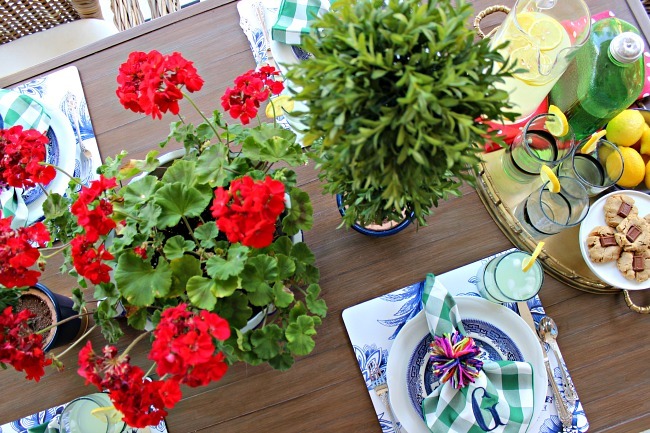 I also love that you used multiple colors and textures for the home decor it brings depth to the space.